Now an issue of Fantastic from very late in Cele Goldsmith Lalli’s tenure. I’ll note first that the subtitle of the magazine is “Stories of Imagination.” What this means, it appears, is that Fantasy is allowed, but not required. I had a notion that Fantastic at this time was a Fantasy magazine, but that’s not the case yet. (It was, pretty much, by the time I was subscribing, during Ted White’s era in the mid-70s.) It should be noted, however, that from September 1959 to September 1960 the subtitle was “Science Fiction Stories” – so certainly “Stories of Imagination” implies a more wide range of stories. I suppose that in 1965, Fantasy was not yet a self-supporting category – Tolkien’s books were just about then exploding in popularity, and I guess it was with those that a separate category was born. 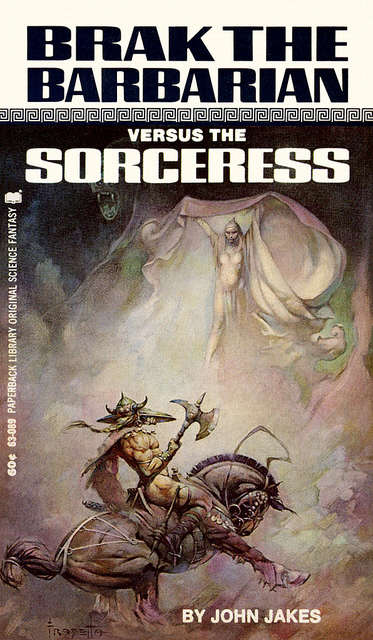 Indeed, the “standard history” places the origin of Fantasy as a truly separate category in the mid-60s, pushed not only by Tolkien, but the success of Lancer’s Conan reprints – in a sense, the deal was sealed with Ballantine’s Adult Fantasy series in the late 60s, and things were confirmed with Terry Brooks’s The Sword of Shannara and then Stephen R. Donaldson’s Thomas Covenant series in the mid-to-late ’70s. 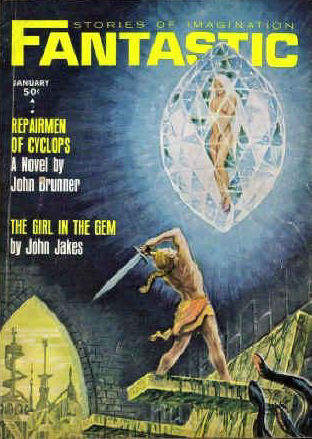 The cover is by Ed Emshwiller, illustrating John Jakes’s short story “The Girl in the Gem” (who for once doesn’t look like his wife Carol). Interiors are by Emsh and Schelling. Besides house ads, there are full page ads for the Rosicruans, and for the Consumer Service Company (purveyors, it seems, of flashlights and such). Also, there are spot ads for C.A.R.E., Hollywood Music Productions (looking for songwriters), and for G. P. Putnams (advertising Farnham’s Freehold)). Also reviewed are an Ambrose Bierce collection, edited by E. F. Bleiler, and a Weird Tales selection from Leo Margulies. Both meet with his approval, as does a reprint of Bradbury’s The October Country (“none of the sentimentality, none of the slushiness of thought, none of the slovenliness of construction that marks latter day slick Bradbury” – exactly! ), and a reprint of Williamson’s Weird Tales serial Golden Blood. There are 5 short stories, of which I would consider two to be Science Fiction, three Fantasy. (The serial, also, is indubitably Science Fiction.) Jakes’s “The Girl in the Gem” (6,500 words) is very ordinary sword and sorcery. Brak is framed for stealing valuables from the palace of Lesser Tyros, where the King is dying. His daughter offers him an out – go to the formerly submerged city of Greater Tyros, just offshore, and free her younger sister from the gem in which a sorcerer imprisoned her. Brak proceeds to attempt just that, braving a dangerous sea-creature, only to encounter treachery. Bryce Walton’s “Journal of a Leisured Man” (5,000 words) is SF horror about a man who has lost his job to automation, and his wife to another man, and who is going nuts with boredom, until he is offered a life-like automaton version of his wife as a replacement companion. OK stuff, with a decent dark ending that it takes a bit too long getting to. Robert F. Young’s “On the River” (4,500 words) is a predictable afterlife fantasy about a man and a woman who have decided to commit suicide, but as they die, meet each other in a shared dreamscape and fall in love, even realizing they had lived very close to each other… but now they are dying. David R. Bunch offers “Make Mine Trees” (1,200 words), very strange horror about a man whose wife left him for another man (a Spanish dancer) and who is raising his son alone while working on a formula to save the world. What the formula really does is slowly revealed… pretty effective. And “Multiple Choice” (2,700 words), by John Douglas, is also horror – SF horror, in which 15-year-old boys are subject to an examination to determine their fitness for government service. As they wait their test, a group of boys speculates on the rumors of the fate of those who fail… Also pretty effective stuff. Indeed, three of the stories here are definitely horror, and the other two have aspects brushing on horror. (For that matter, a key theme of the serial is rather horrific.) I’m not sure to what extent this was common for Fantastic at that time. 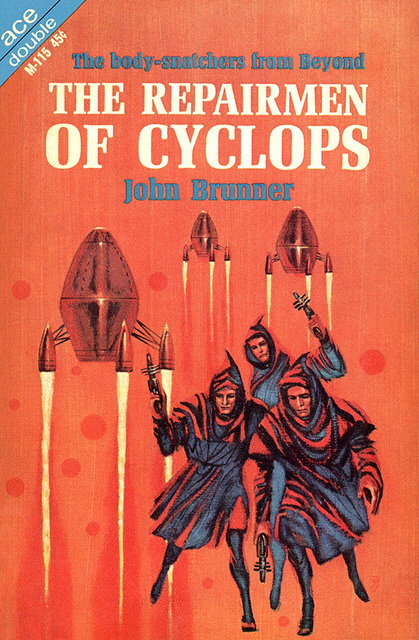 Finally, the serial is Part I of John Brunner’s “The Repairmen of Cyclops.” This is one of his trio novels (all originally in book form as Ace Doubles) about the Zarathustra Refugee Planets, which were settled by people fleeing a planet whose sun was about to go nova. These refugees ended up on at least 21 planets, which are benignly neglected upon rediscovery by later Galactic society. The three novels Brunner wrote about the ZRPs were Secret Agent of Terra (1962, revised 1969 as The Avengers of Carrig), Castaways’ World (revised 1974 as Polymath), and The Repairmen of Cyclops (1965, revised lightly and republished under the same title in 1981). The three were reprinted in a single volume in the UK in 1989 as Victims of the Nova. As best I can tell with a quick look, the serialization in Fantastic is the same as the 1965 Ace Double version, which was about 45,000 words. (The later revision was expanded to about 50,000 words). This part 1 is about 22,000 words long. The story concerns a Galactic Patrol woman investigating a plot by the authoritarian ruler of the planet Cyclops to exploit one of the Zarathustra Refugee planets in a rather horrific way. I enjoyed it, as I generally enjoy early Brunner. If anyone is interested, Open Road Media maed “The Girl in the Gem” free for download as a promotion for the other Brak tales being e’collected. I really like these retro reviews. Context is useful in helping us to appreciate the genre. It is curious that with the publication of the last of the Swords Against Darkness and Flashing Swords anthologies at the end of the ’70s, the Conanesque simply disappeared and the Tolkeineque took over. Before that, during the Conan craze in Marvel comics for example, larger fandom seemed to show virtually no interest in Tolkien. After, nothing but. I can’t help but think the constriction has negatively affected fantasy, since the stories put out by the Fantasy Writers of America tended towards more variety and cleverness. Norton, Vance and Wellman wrote very clever stories not all that susceptible to stereotypes. Vance’s Lyonesse series, though steeped in traditional myths, is in fact a breakout series and eccentric to the max. I loved the first of the Witch World novels cuz you had no idea where they would go next. From the medieval to submarines? Gotta like that. Thanks! That’s a handy link. > Before that, during the Conan craze in Marvel comics for example, larger fandom seemed to show virtually no interest in Tolkien. After, nothing but. I think you’re very right. It had a lot to do with the runaway success of THE SWORD OF SHANNARA in 1977, of course. SHANNARA was written (and heavily marketed) as a Tolkien clone, and it became the first work of fiction to appear on The New York Times trade paperback bestseller list, where it stayed for over five months. Suddenly a lot of hungry writers realized, “Hell, I can do THAT,” and the era of fat fantasy trilogies was born (arguably, we’re still living in it, over 3 decades later). James May wrote, “It is curious that with the publication of the last of the Swords Against Darkness and Flashing Swords anthologies at the end of the ’70s, the Conanesque simply disappeared and the Tolkeineque took over. From my research, it appears to me that we can begin the history of Conan vs. Middle-earth in the 1950s, when Gnome Press issued its collections of old and new Conan stories, and The Lord of the Rings was first published. These were hardcover books. Ace also issued Conan the Conqueror/The Hour of the Dragon as one side of a paperback Double. Fandom responded to both. Go to Efanzines.com for Gary Hunnewell’s Tolkien Fandom Review series, tracing the explosion of fanzine articles devoted to Tolkien. As for Conan, the fanzine Amra was started. I don’t -think- there was a lot of other Howard-related fannish activity. But Tolkien won a fannish award around 1957. However, sword-and-sorcery formula fiction did develop early, while I don’t know that any publishers seriously tried to publish Tolkien imitations till those Shannara books from around 1976 on. But you had Jakes’s Brak stories from the early 1960s, in Cele Goldsmith’s Fantastic magazine, etc.